Last week over 20 Ohioans, including members of Project Peace and Northwest Ohio Free Speech Alliance, traveled to the Ohio Statehouse to give testimony opposing House Bill 476, the bill to prohibit a state agency from contracting with for-profit entities that divest from or boycott Israel. In spite of our best efforts, the bill was rushed through the lame duck session of the Ohio General Assembly and is now sitting on Governor Kasich’s desk. Will you call him this week to ask him to veto the bill? House Bill 476 is a response to the Boycott, Divestment and Sanctions (BDS) movement. It runs counter to the core values of the U.S. and Ohio constitutions. The bill punishes economic boycotts, which are entirely lawful acts of free speech. It interferes with US foreign policy and rampantly violates Ohioans’ free speech rights. If passed, any company, including all for-profit sole proprietorships and partnerships as well as corporations, desirous of receiving payments or benefits from the state of Ohio will be required to sign away its right to oppose Israel’s illegal occupation of Palestine. Participation in much of Ohio’s economic activity will require a coerced foreign policy position. The bipartisan co-sponsors of H.B. 476 aim to shut down supporters of the international BDS movement, which is based on the anti-apartheid campaign against South Africa of a quarter century ago. BDS is a nonviolent global grassroots effort to restore the fundamental human rights of Palestinians. 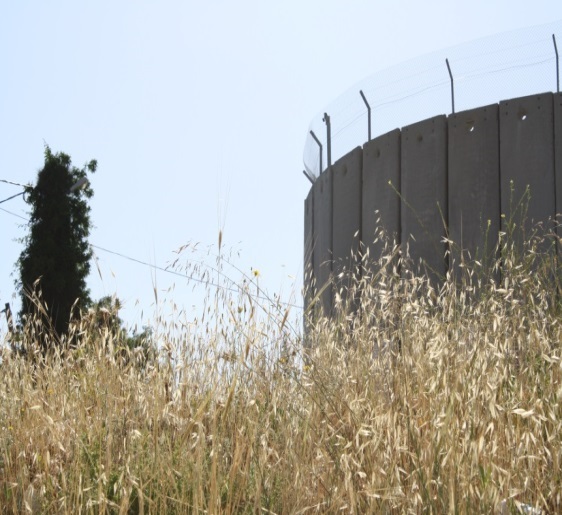 The campaign is aimed at building pressure on the state of Israel to end its illegal occupation and to follow international humanitarian law in its policies toward, and treatment of, Palestinians. Will you please call Governor Kasich’s office to ask him to veto the bill? Ask him to protect Ohioans’ free speech rights. Let him know that economic boycott is a right protected by the Constitution and is a time-honored method to protest oppression and human rights violations. The Governor’s office phone is: (614) 466-3555. You will probably reach his voice mail and will be asked to leave a brief message. You may also use the contact form at the Governor’s web page. If you’d like to learn more about the bill, click here for the legal memo explaining how the bill violates state and federal laws. Here is the legislative page for HB 476. Many thanks for your advocacy! 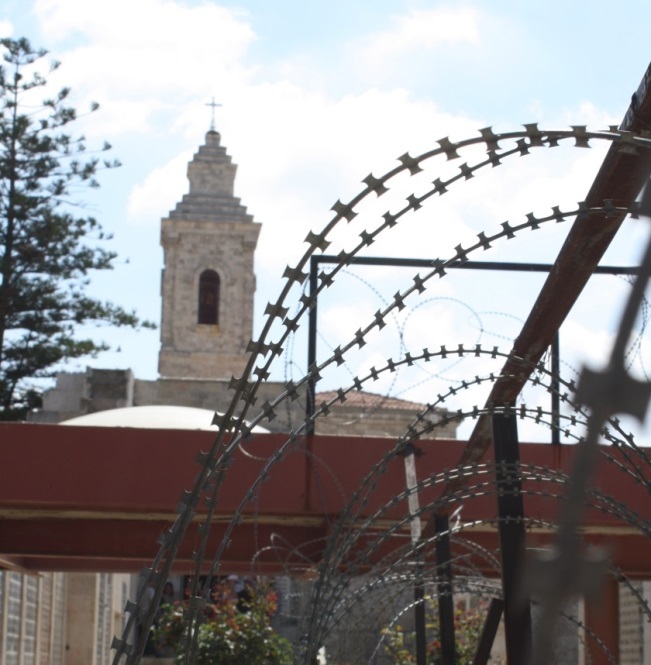 Ghost Town-The Hebron Story is a documentary directed by Ellie Bernstein, an advocate for social justice. The film released, in 2014, narrated by Martin Sheen, tells the story of the on-going conflict between Israel and Palestine with a focus on the city of Hebron, a microcosm of the West Bank. Al-Jazeera International Documentary Film Festival 2016. Sr. Paulette Schroeder, who served with CPT in Hebron and has a brief role in the film, will join Ellie for an Ohio film tour. Ellie and Paulette will lead a discussion after the film screening. Heidelberg University, Herbster Chapel, Feb. 18, 7:00 pm. Bluffton University, Feb. 22, 7:00 pm. We made several important stops in Bethlehem today including that of coming to understand Palestine Kairos better and visiting Wiam which works to help reconcile people with each other when there are conflicts. What worked on my mind and heart most today though was the street activity. Friday’s the prayer day for the Muslims, and during the last days the Israeli military is making movement onto the Palestinian mosque threshold. Palestinians know from experience that this means perhaps some of this famous mosque will be handed over to the Jews and will become a synagogue. Then Israel yesterday said that the soldiers have permission to now use live ammunition for anyone who has thrown a stone at them. This has enraged the Palestinians who don’t have any defense nor voice to raise their concerns. We escaped the tear gas, but lots of young Palestinians did not. Tomorrow will be a tamer day. We’re on the last leg of our journey and what a journey it has been! The nine of us now pretty much seem like a family…I mean you’d find the fussing among us that you’d find in a natural family. Everyone is helping to lead the group it seems! We interviewed an Israeli settler who presently lives in Efrat settlement. He was so congenial and hospitable to us,but when we began to question him about all the information we received from the U.N., from the research water rights group Arij, and after we had walked through the refugee camps and had talked with the people of the camp, this settler gentleman said what all these people had said are lies. Now in Hebron, it is tense because a 17 yr old young Palestinian woman was killed today and just recently a whole Palestinian family was burned by the settlers and they all died. We are on the eve of a holy day for both the Jewish and the Palestinian communities. That makes it tense here with many more soldiers and settlers out on the streets. I don’t know what will happen tomorrow, but all the people could use a prayer. In just 2 more days we will be heading home. So many of the Palestinians have begged us to come to their homes to eat with them. How I wish we could have time to enjoy all their hospitality. This is our second day and what a day this was! First we met Sammie who heads the Pontifical Commission in the Holy Land! He showed us how the Christian numbers have gone down so immensely the last 15 years due to the Occupation of the Palestinian land. He showed us some hopeful movements by the churches, but the situation is still desperate. Then we visited the Holy Sepulcher and the Ethiopian Community of monks and nuns who live on the rooftop of this holy site. How beautiful they are! 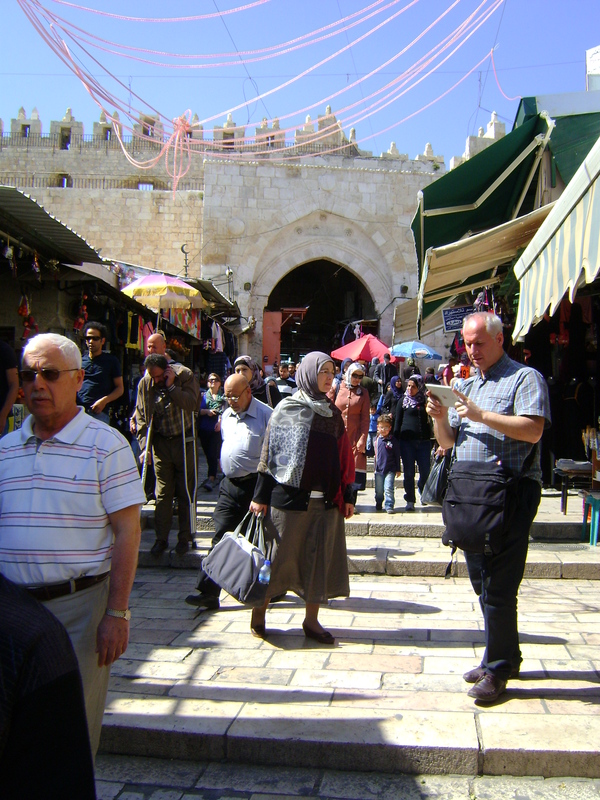 Of course we had a tasty Palestinian lunch and then began to make our way up to the Jewish Wailing Wall and over to the mosque where it is said that Abraham was going to sacrifice Isaac. That mosque is HUGE and is made Of the tiniest glittering mosaic pieces on the outside. From there we were bused to Mt. Olives. From this high altitude we could see how the WALL is snaking around Palestinian villages to kind of strangle their way of living. Oh we also got a young Woman who works for the Lutheran Church here to tell about Victoria Hospital l on Mt Olives.—it takes in only kids and adults from Palestine who are suffering from cancer or diabetes–good work! How varied the people we met! How hard some groups work to keep Christians living in this land of Jesus’ birth! How unjust to take away people’s land and their source of livelihood! How much faith and endurance it takes to live over here! 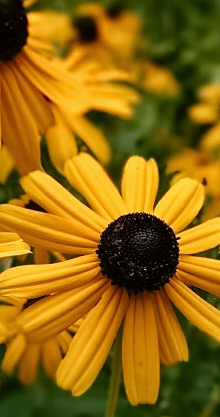 ….I just keep learning so much….I wish you all could be here! 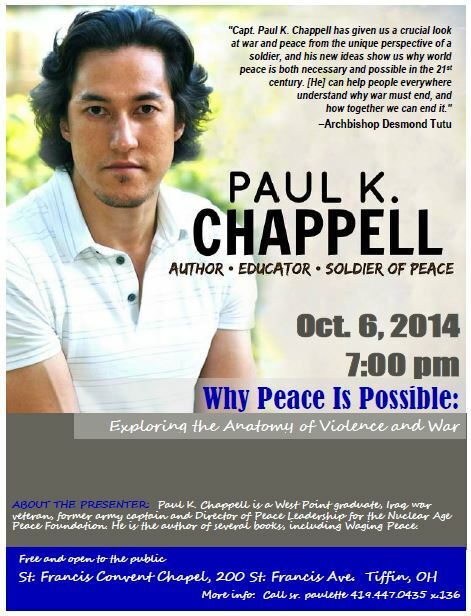 Join us November 7-8 in Tiffin for Paul Chappell’s workshop, Peace Leadership in Difficult Times. Click here to download the event flyer for complete registration information. 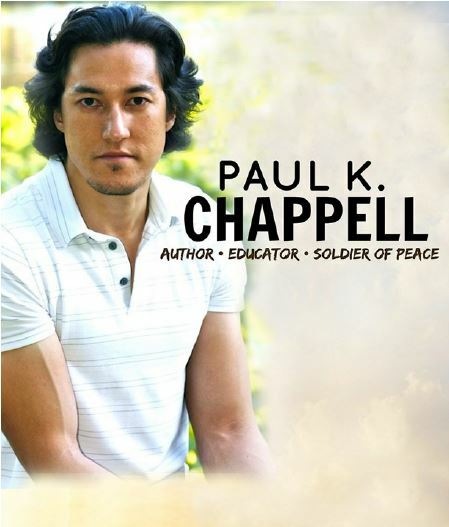 Paul K. Chappell is a West Point graduate, Iraq war veteran, former army captain and Director of Peace Leadership for the Nuclear Age Peace Foundation. Sr. Paulette is now accepting registrations. 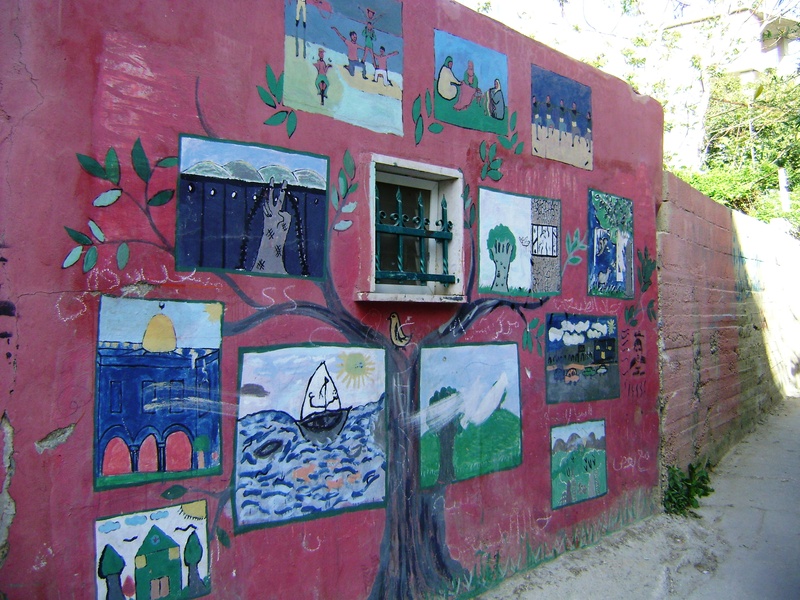 The Project Peace July Newsletter is out! Our Peace Camp for children—”Pickles , Pie, Peace, and Me” concentrated on children being “in a pickle” and how to deal with such a small or large problem or conflict in their lives. Join us as we hear veteran Paul Chappell on the topic, Why Peace is Possible: Exploring the Anatomy of Violence and War. Paul has reflected on his experience as an army captain in the Iraq War to develop ideas about waging peace in his work at the Nuclear Age Peace Foundation. 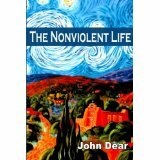 He will speak at St. Francis Convent on Monday, Oct. 6, 7:00 pm. He will also appear earlier in the day at Tiffin University Chisolm Hall at 11:00 am and the following day at Heidelberg University Campus Center at 7:00 pm. All events are free and open to the public. Learn more about Paul at www.paulkchappell.com. The situation is now desperate in Gaza. In so many ways we have pleaded with Congress and the President to have the guts to speak the truth about Israeli aggression against the Palestinians, about the “truth on the ground.” No matter how many marches, demonstrations, risks for arrests people have taken throughout the world in huge numbers to beg for human compassion and justice toward the Palestinians, the people who are supposed to represent us to the world have failed in courage, in human rights, in common sense. Therefore, in prayer I have peacefully come to hear what I believe is a public call to Fasting, to allow God’s unconditional love for each human being—you, me, Palestinian, Israeli—to come through more purely, more intensely for all who suffer this horror in Gaza. The greater love and energy of God must empty me out, all of us who choose to fast, to be better, stronger, larger receptacles for God’s grace and love to pass to the Palestinians and to all involved in the peace negotiations. This first week of liquid-only-fasting (or any form of fasting meaningful to you) is not meant to be a political statement. This week of fasting is not begging any admiration or pity from anyone. It is begging for truth and justice to drive our country’s relationships with Israel and Palestine. Please join me if possible for any part of this liquid-only-fast or for the whole fast beginning Sunday July 27 1:00pm. until Sunday August 3 1:00pm. If anyone wants support or more conversation about this effort please call sr. Paulette 419.447.0435 ext. 136. There will be a prayer hour on Tuesday 7:00 pm. in St. Francis Chapel for justice and peace and end to all violence in Gaza. Please join us for any/all of the hour. Most of the hour will be in silent prayer. If you will be joining in on this fast on any level, please respond (pauletteosf@hotmail.com), and I will try to write once or twice to you during this time with pertinent material or articles on the situation. Thank you.